Courtesy of DJ Perry Jr. There are thousands of student-athletes who participate in NCAA-sanctioned sports on hundreds of campuses across the nation. Some are on scholarship, many receive help from college academic support personnel to stay on top of their coursework, and most have their their athletic travel expenses covered. And then there are the thousands of student-athletes who participate in club sports. “I’m going to be honest, it’s definitely really hard,” said Angie Yao, a sophomore elementary education major at Michigan State University and a a member of the club figure- and club synchronized- skating teams. Club student-athletes typically do not receive sports-related scholarships, have no special academic assistance and pay out-of-pocket for their travel expenses. Yao, a native of Buffalo Grove, Illinois, said she often feels overlooked. At Michigan State University, there are 53 club sports programs — from as big as football and basketball to as small as quidditch and kendo. These programs serve as outlets for students to continue — or find — their passion for sport. However, one of the biggest problems club sports athletes run into during their time as students is travel, said Ellie Schramm, a member of the women’s club lacrosse team at Michigan State. Not only do some students pay out of pocket for travel for tournaments and games, but many are forced to miss school and make up work they wouldn’t have had to otherwise. For philosophy and political science senior DJ Perry Jr., having a commitment to stick to — like being a captain and serving on the board of the newly formed MSU club football team — actually helps him stay organized. “It’s not much of a time constraint,” said Perry, of Detroit. “Personally, I feel like it’s helped me be better. I’ve played football since I was 4 years old. So I always had a set schedule with my days. I’ve been able to use that and build my schedule (help with) time management. Kelsey Daldine, a kinesiology senior from Clinton Township, Michigan, says her time on the competitive cheer and stunt clubs at Michigan State have increased her organizational skills. “For me it has a positive impact because if I didn’t have set practice times and travel times, then I wouldn’t (be as good with time) management as I am,” she said. “So it kind of sets a schedule of what I need to do every day. 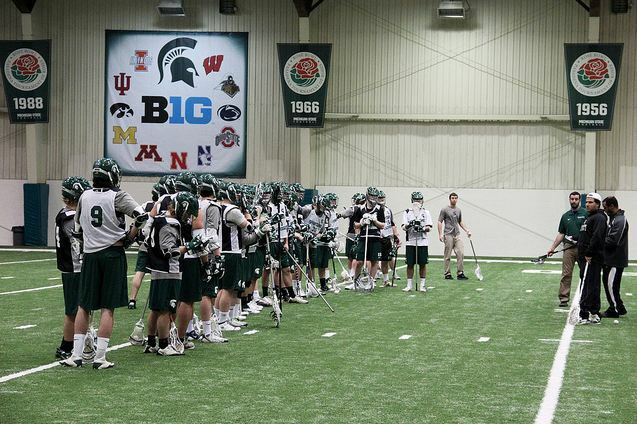 Jess Todd, a journalism senior from Massachusetts, recalled a time when traveling to Baltimore for the Michigan State men’s club lacrosse tournament threw a wrench into his weekly routine. Injuries can also create challenges. An injury last season sidelined Perry for the entire year. “I trained this past year harder than I’ve ever trained before for this season,” Perry said. “And I had all that completely taken away from me because I got hurt. But being a captain and being on the (executive) board, I still had to be there and I couldn’t miss out on things just because I was hurt. When a student-athlete on an NCAA-sactioned team gets injured, they may have an entire team of medical professionals to help them with diagnoses, rehabilitation and in some cases, financial expenses for surgical procedures. At a Big Ten university with more than 50,000 students like Michigan State, there are plenty of athletes across multiple sports. And, even at a Big Ten university with a significant sports culture, club athletes can sometimes feel left out, Todd said. Instead, varsity sports often get most of the attention. Few collegiate athletes will ever play professionally, according to data from NCAA. That can lead to challenges — and opportunities — as former athletes transition into life after sports. How do athletes balance work and play during their college years? The Spartan Newsroom explores the lives of student-athletes in and out of the field of play.